Dr. Eduard Egarter-Vigl, left, and Dr. Albert Zink take a sample from the Iceman in November 2010. 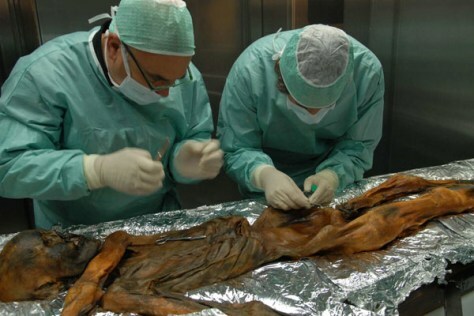 The 5,300-year-old mummy dubbed Otzi was discovered in the Eastern Alps about 20 years ago. Tests show he was, among other things, lactose intolerant.